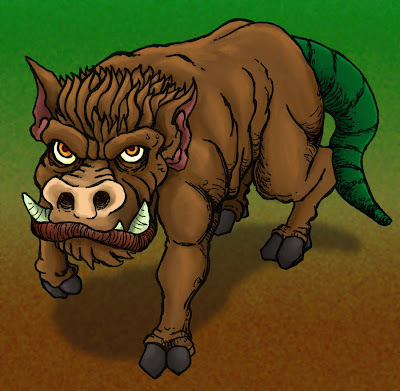 A massive, lumbering giant, like a cross between a warthog and a Komodo Dragon, the Gorehog is as dangerous as it sounds. Standing 9 feet at the shoulder, these gargantuan animals are voracious, omnivorous eating machines that are decimating ecosystems world wide. Gorehogs were first sighted in the lush wilderness surrounding the Chernobyl disaster, but soon spread outwards like a plauge. As thier meat is highly prized for it's tenderness there exists a thriving economy of Gorehog hunters. Attempts to domesicate the massive creatures have thusfar failed.